At least Chesapeake Energy is getting positive attention on the sports pages if not the business pages. NEW YORK (CNNMoney) -- The Stadium Sponsor Stock Curse strikes again! 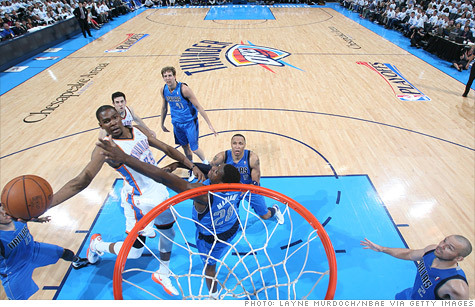 The victim this time is Chesapeake Energy, whose name appears on the arena that hosts the NBA's Oklahoma City Thunder. The curse is a somewhat fanciful but surprisingly consistent factor that CNNMoney has tracked for about a decade. It appears to weigh on the stock performance of companies with enough hubris to put their names on major sporting venues. Chesapeake (CHK, Fortune 500)'s share price has been chopped nearly in half over the past 12 months, with the slide starting just after the company signed the $3 million a year naming rights deal last June. That seems about right, as far as the curse is concerned. Of the 60 publicly traded sponsors, 37 of them -- 62% -- have had their stocks lose ground in the past 12 months, with an average drop of 21%. The S&P 500 is up 2.4% in the same period. Of course, there's little supernatural or superstitious involved in Chesapeake's slide. CEO Aubrey McClendon was just stripped of his title as company chairman due to controversy about an incentive program that allowed him to take personal stakes in wells drilled by the company. He used that stake to borrow as much as $1.1 billion in loans not disclosed to shareholders, according to published reports. The SEC is investigating. In addition, Chesapeake's profits have been hurt by rock-bottom natural gas prices. If it's any consolation, Chesapeake is getting positive buzz after the Thunder captured two exciting NBA playoff games at home and another on the road to take a 3-0 lead on the defending champion Dallas Mavericks. The Thunder are guaranteed of playing more games in the Chesapeake Energy Arena, either later in the first round, or in the next round. The Thunder's opponent in the NBA is the Dallas Mavericks, who play in another cursed arena -- the American Airlines Center in Dallas. Last year, Dallas-based American had its name on both arenas used in the NBA Finals -- the Miami Heat play its games in the American Airlines Arena. But last November, American parent AMR (AAMRQ) became the latest U.S. airline to file for bankruptcy, essentially wiping out shareholders. Its shares have lost 90%. American's trip to bankruptcy is not unique for stadium sponsors. There are also two other arenas bearing the names of airlines that flew in and out of bankruptcy while maintaining their sponsorship deals -- the United (UAL, Fortune 500) Center in Chicago, and Toronto's Air Canada Centre. In addition, 12 other stadiums or arenas used by the four major North American team sports leagues were once adorned with the name of a company that went bankrupt. The former Enron Field in Houston, now Minute Maid Park, is probably the most famous. Several other former sponsors have vanished, bought in a weaken state by a competitor or shut down by a corporate parent tired of losses. So even as Chesapeake struggles with its run of bad news this weak, its shareholders can take solace. The curse might be hurting, but it could be worse.